Hydraulic oils are integral part of hydraulic systems; they provide qualitative transmission of mechanical energy directly from the source to the point of use. There are a lot of brands of hydraulic oils, but we can say the best are XADO oils. Oil change in a power steering: which one to choose? There are several types of XADO hydraulic oils that are able to provide qualitative power steering care and they have some differences. Synthetic oil is considered to be the best fluid for the power steering and central vehicle hydraulic system. This fluid is used for one-time filling during the whole operational life of a vehicle. Anti-corrosion properties of this fluid protect pumps and drive connections, line tubes and switchgear joints from rust and corrosion. Using XADO synthetic hydraulic oil is the guarantee of reliable operation of the hydraulic system in a vehicle. 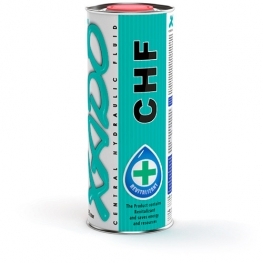 XADO mineral hydraulic fluid also creates the proper conditions for a correct operation of the hydraulic system. Great lubricating properties, compensation of the current wear, prevention from internal leaks occurring – these are the advantages of XADO mineral hydraulic fluid. Where to buy hydraulic oil? If you want to buy hydraulic oil, additives for hydraulic lifter, car care products, various Revitalizants® and other products xado.us e-store is what you need! Qualitative hydraulic oils with reasonable prices, high service standards, wide range of products these are the benefits buying at our e-store.